Alcaeorrhynchus grandis (Giant Strong-nosed Stink Bug). Size: approx. 20 mm. Photo: 10/28/13, 1 pm. Hey, who doesn't like a giant stink bug on their window? 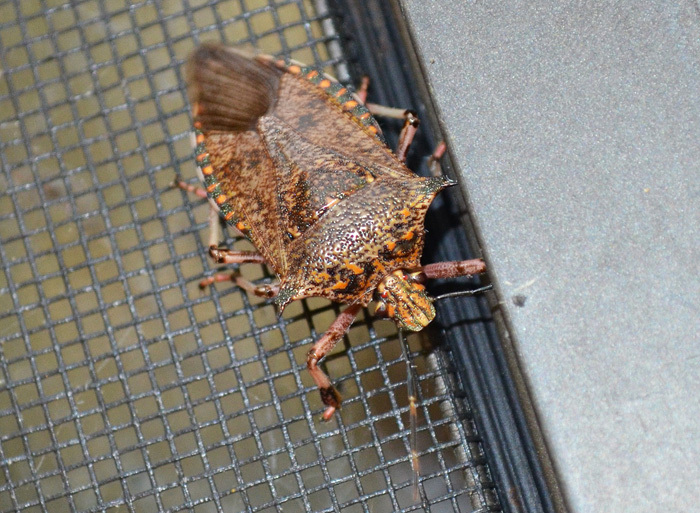 This predatory stink bug preys on other insects, especially lepidopterous larvae and can be found in several row crops and close to streams and marshes. Females are slightly larger than their male partners and can reach a length of a full inch. Instars III-V are blueish black with striking red keels on their pronotum.